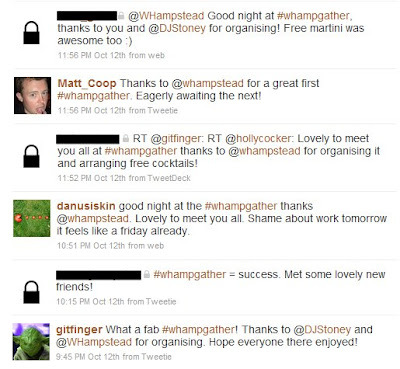 “Whampgather” tweet-up makes the news The first ever whampgather took place on Monday 12th at The Alice House. An early glitch, when the staff were unaware that free drinks had been arranged, was soon rectified. There was a terrific turnout, despite tube and bus delays doing their best to slow people down. 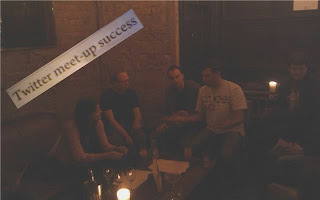 Sixteen people, the vast majority of whom had never met each other before, all chatted about their experiences of the area, and were able to draw all sorts of connections. Having bombarded Stephen Fry with invitations, we were delighted when he finally saw one from @JudeStone and sent a reply. 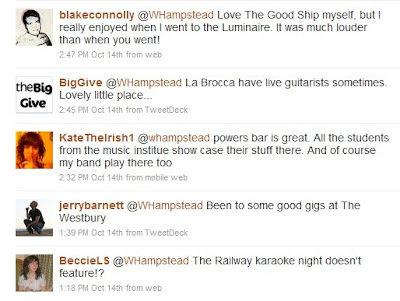 No awkward silences meant no time for the “Rename whampgather” competition, and the consensus was that we should stick to whampgather. Therefore, the draw to win an NW6 t-shirt from @ilovemypostcode took place on Tuesday – the winner seemed pleased. Whampgather excitement lingered late into the week as @SarahReardon worked some PR magic on the Camden New Journal. The article appeared in Thursday’s edition (although the paper is not readily available in West Hampstead) and online on Friday. The CNJ has said that it may even attend the next one. So, put on your best frocks and, again, doctors notes are the only acceptable excuses, although this one from @Choppsicle comes very close. Camden council listed 10 of the best live music venues in the borough but of local places, only The Good Ship made the cut. Readers had other ideas. There’s also professional music at The Railway, Lately, and even Pizza Express. Talking of which, @bubela had heard from local shopkeepers that West End Lane’s Pizza Express was going to be closed and turned into a Sainsbury’s. Digest contacted Pizza Express who categorically denied that the branch was closing, “West Hampstead is a really popular PizzaExpress,” according to spokesperson Alex Whitelaw. The general election has yet to be called, but unofficial electioneering has started. West Hampstead is in the new constituency of Hampstead & Kilburn and with redrawn boundaries, the Tories and LibDems are already arguing over which of them is the true challenger to Labour. The three candidates are existing Hampstead & Highgate MP Glenda Jackson (Lab), Chris Philp (Con) and Ed Fordham (LibDem). Only Fordham is on Twitter, where he directs followers to blog entries about local architecture as well as to political material. All three were at the Tricycle this week for hustings. Fordham posted extracts of the event – focused on his performance – on his YouTube channel, including a robust defence of Kilburn in the face of those who talk it down. Digest is more than happy to direct its readers to similar links from the other candidates. We will follow the progress of the main three parties up to the election, keep you up to date with the other candidates, and run some very unscientific polls to gauge your thoughts. Tube fares rise. What tube? 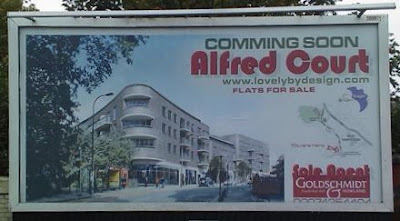 Photo of the week – Read closelyMaybe that was the spelling in King Alfred’s time. Thanks to @PkerUNO for spotting this West End Lane billboard.